Colin Kaepernick’s football career may be in limbo, but that isn’t stopping him from continuing his community service benefiting those in need. 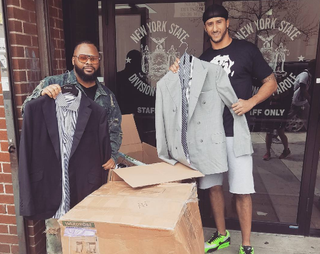 Over the weekend, Kaepernick made a visit to a New York City parole office and donated two large boxes of custom-made suits to benefit 100 Suits for 100 Men, an organization that provides men and women transitioning from prison with free suits to help with their job search. Kevin Livingston, the CEO of 100 Suits, said that he was put in touch with Kaepernick after he did a Hot 97 interview with Kaepernick’s girlfriend, radio personality Nessa. “He was a great partner,” Livingston told TMZ. “He went above and beyond all expectations to help give these guys a second chance. “He’s a hero in my eyes, he’s a hero in the eyes of the guys who are going to be receiving these suits. Colin, you’re the man to me; you’re a hero to the men of South Jamaica, Queens,” Livingston added. To learn more about the organization, visit its website.